Samsung Galaxy Tab 2 10.1 is really a powerful rival to Motorola Xoom. It also features a 10.1 screen and supports 1080p video playback. In addition, the Galaxy Tab 2 10.1 has equipped with Android 3.1 system. With this big screen tablet, playing movies is really a pretty good thing to kill time. To playback your DVDs on Galaxy Tab 2, you need to convert them to compatible video format for it, and H.264 (.mp4) is the most suggested one. 1. 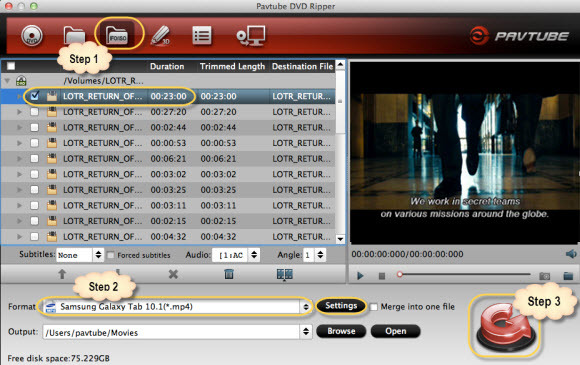 Load DVD ISO/IFO to Pavtube DVD Ripper. Click the "ISO/IFO" icon on the interface to load the DVD you want to convert. You can also add from disc by clicking the first icon. -Select the movie title you want to convert, and preview the file you just selected from the DVD movie in the preview window if you want. -Select wanted subtitles and audio track if necessary. This DVD Ripper is not only able to support Galaxy Tab 2 10.1 Media transfer, but also transfer video file to Galaxy Tab 2 10.1 as you may have other formats of source videos.